Close ER: The Case for the Non-Quantum Receptor, in Toward a Science of Consciousness. Tucson II, 1996. Close ER: “The Earth Is Expanding”, Telicom, The Journal of the International Society for Philosophical Enquiry, (ISPE) 24:1; 20-29, 2011. Neppe VM, Close ER: Triadic Dimensional Distinction Vortical Paradigm: Priorities. Dynamic Journal of Exceptional Creative Achievement 1201:1201; 1031-1043, 2012. Neppe VM, Close ER: The Thirty Key Points Perspective of the TDVP (Triadic Dimensional Distinction Vortical Paradigm): Priorities. Dynamic Journal of Exceptional Creative Achievement 1201:1201; 1044-1058, 2012. Neppe VM, Close ER: The Seventy Other Elements to the TDVP (Triadic Dimensional Distinction Vortical Paradigm): A Summary. Dynamic Journal of Exceptional Creative Achievement 1201:1201; 1059-1078, 2012. Neppe VM, Close ER: Limitations of the Standard Model of Physics. Dynamic Journal of Exceptional Creative Achievement 1201:1201; 1001-1010, 2012. Close ER: Why the Earth May Be Expanding or Is it Only Expansion of the Universe?. Dynamic Journal of Exceptional Creative Achievement 1211:1211; 18**-18**, 2012. Close ER, Neppe VM: Space, Time and Consciousness. A Linkage. Dynamic Journal of Exceptional Creative Achievement 1202:1202; 1101 -1115, 2012. Neppe VM, Close ER: The Qualit Model: Extending Planck. Dynamic Journal of Exceptional Creative Achievement 1208:1208; 1559-1568, 2012. Neppe VM, Close ER: “The Infinite: Essence, Life and Extropy” , Dynamic Journal of Exceptional Creative Achievement 1202:1202; 1159-1169, 2012. Close ER: “Determinism, Probabilism, Free Will and the Need for a New Scientific Paradigm”, Telicom 23:4; 29-37, 2010. Neppe VM, Close ER: What Do Reality, Distinctions and Dimensions Mean in a Consciousness Model? Dynamic Journal of Exceptional Creative Achievement 1203:1203; 1180-1189, 2012. Close ER, Neppe VM: Space, Time and Consciousness: The Tethered Triad. Seattle: Brainvoyage.com, 2013 (In press). Close ER: The Calculus of Distinctions: A Workable Mathematicologic Model across Dimensions and Consciousness. Dynamic Journal of Exceptional Creative Achievement 1206:1206; 1387 -1397, 2012. Close ER: Close’s Calculus of Distinctions and Indications. Dynamic Journal of Exceptional Creative Achievement 1211:1211; 17**-17**, 2012. Close ER, Neppe VM: Dimensions, Distinctions and the Role of the Metaconscious. Dynamic Journal of Exceptional Creative Achievement 1211:1211; 18**-18**, 2012. Close ER, Neppe VM: Concepts and Definitions in the Triadic Dimensional Distinction Vortical Paradigm (TDVP) Model. Dynamic Journal of Exceptional Creative Achievement 1203:1203; 1190 -1203, 2012. Close ER, Neppe VM: Dimensions Beyond Conventional Physical Reality. Dynamic Journal of Exceptional Creative Achievement 1203:1203; 1240 -1246, 2012. Close ER, Neppe VM: More on the Vortex. Dynamic Journal of Exceptional Creative Achievement 1209:1209;, 2012 (In press). Neppe VM, Close ER: Proposed Solutions to Complex Ideas on Vortices. Dynamic Journal of Exceptional Creative Achievement 1209:1209;, 2012 (In press). Close ER: Free Will: Are We Free? Or Does Determinism and Probabilism Dominate?. Dynamic Journal of Exceptional Creative Achievement 1211:1211; 18**-18**, 2012. Close ER: Time and Consciousness: A Mathematical Basis. Dynamic Journal of Exceptional Creative Achievement 1204:1204; 1316 -1330, 2012. Close ER, Neppe VM: Important Triadic Dimensional Distinction Vortical Paradigm (TDVP) Axioms. Dynamic Journal of Exceptional Creative Achievement 1205:1205; 1331 -1341, 2012. Close, E.R., Neppe, V.M., “Triadic Dimensional Distinction Paradigm Shift”, Toward a Science of Consciousness. Tucson , AZ, 2012. Close ER, Neppe VM: Where Does Quantum Entanglement Fit the Triadic Dimensional Distinction Vortical Paradigm (TDVP) Model Dynamic Journal of Exceptional Creative Achievement 1205:1205; 1342 -1351, 2012. Close ER: Fermat’s Last Theorem. Close’s Proof in the 1970s. Dynamic Journal of Exceptional Creative Achievement 1208:1208, 2012 (In press). Neppe VM, Close ER: Consciousness and the “Theory of Everything” ("TOE"). Dynamic Journal of Exceptional Creative Achievement 1211:1211, 2012 (In press). Close ER, Neppe VM: The Principles and Postulates Behind the Triadic Dimensional Distinction Vortical Paradigm (TDVP) Model Dynamic Journal of Exceptional Creative Achievement 1206:1206; 1409 -1420, 2012. Close ER, Neppe VM: The Mathematicological Adaptations of the Triadic Dimensional Distinction Vortical Paradigm (TDVP) Model Dynamic Journal of Exceptional Creative Achievement 1206:1206; 1421 -1427, 2012. Neppe VM, Close ER: Where Does Unified Monism Fit into the Triadic Dimensional Distinction Vortical Paradigm (TDVP) Dynamic Journal of Exceptional Creative Achievement 1207:1207; 1428-1439, 2012. Close ER, Neppe VM: Mathematics Concepts and Triadic Dimensional Distinction Vortical Paradigm (TDVP). Dynamic Journal of Exceptional Creative Achievement 1211:1211; 19**-19**, 2012. Close ER, Neppe VM: The Mathematics of the Triadic Dimensional Distinction Vortical Paradigm (TDVP): Speculations. Dynamic Journal of Exceptional Creative Achievement 1210:1210; 17**-17**, 2012. Neppe VM, Close ER: How Does the Triadic Dimensional Distinction Vortical Paradigm (TDVP) Compare as a Theory of Everything (TOE)? Dynamic Journal of Exceptional Creative Achievement 1207:1207; 1460-1467, 2012. Neppe VM, Close ER: Comparison of the Theories of Everything Involving Consciousness or Dimensions. Dynamic Journal of Exceptional Creative Achievement 1207:1207; 1524-1537, 2012. Close ER, Neppe VM: Whither Transcendental Physics and Vortex N-Dimensionalism? Dynamic Journal of Exceptional Creative Achievement 1207:1207; 1468 -1476, 2012. Close ER, Neppe VM: How the Triadic Dimensional Distinction Vortical Paradigm (TDVP) Works: The Unexplained Now Explained Dynamic Journal of Exceptional Creative Achievement 1207:1207; 1518-1524, 2012. Neppe VM, Close ER: The Value of the Triadic Dimensional Distinction Vortical Paradigm (TDVP) as a Theory of Everything (TOE). Dynamic Journal of Exceptional Creative Achievement 1207:1207; 1548-1558, 2012. 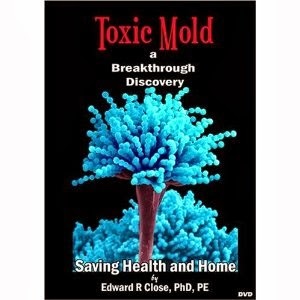 Dr. Close's most popular book, DVD, and educational brochure for mold prevention and remediation are shown below. 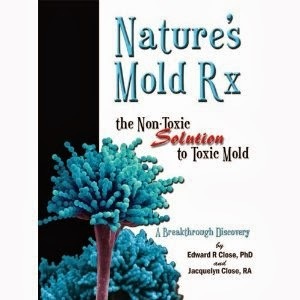 In this clear, easy to understand book, Dr. Edward and Jacquelyn Close provide 20 case studies and detail the discovery of a non-toxic remedy for the problems created by mold and exposure to it. Detailed instructions teach you how to use the exact procedure that Dr. Close developed and pioneered for preventing and eliminating mold from buildings (203 pages). This myth-busting, no-hype video presents scientific data that a safe, non-toxic blend of plant extracts, called essential oils, destroys mold in as little as 24 hours. Learn: Why Bleach is Ineffective -- Disastrous Mistakes almost everyone makes and how you can avoid them -- What mold may be doing to your health -- How to protect yourself, your workplace and your family. Learn about the benefits of a technologically advanced, non-toxic cleaner that is eco-friendly, anti-fungal, anti-bacterial, anti-microbial, yet it contains no synthetic chemical compounds. Best of all, it helps prevent and eliminate mold.